Rare Japanese antique a jinbaori of busho for for outing. Jinbaori (jacket). Used by only very high rank the busho. __ Edo era. / samurai art __. Condition: Very good (antique). I appreciate your understanding. Normally, the brighter the colors used, the younger the person it was intended. Note the transparent quality of fine Ro silk. 1800s Japanese Scarf Shashiko Boro Patched Patchwork Cotton Indigo Antique Old. Shipped with USPS Priority Mail. Wide store shawl scarf, with amazing workmanship. Material Kimono:nice plyester Obi:Silk Jyuban: Polyester. 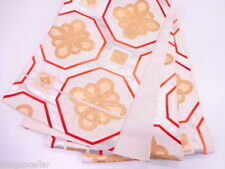 Condition RANK Kimono: A Obi: A Jyuban: B. Kimono:Very Good condition. C: Wearable. Jyuban:Good condition.There are a few tiny stains on the collar. Kusarikatabira(chain armour) for Busho or Ninja. Used by only very high rank the Busho and Ninja. 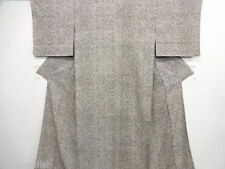 Very rare Japanese antique jinbaori of kusari-Katabira on yoroi or Kimono. __Momoyama era / Samurai art __. Very rare The Japanese antiques set of kamishimo & hakama (old ceremonial dress) for samurai. And they wear it in the castle. 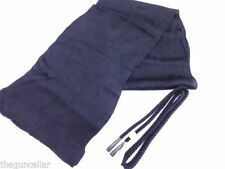 Hakama : Length : 32.6771 in (83cm). __Momoyama ~ Edo era. samurai art __. Fukuro Obi:Very Good condition. Material Kimono:Silk Obi :Silk. Condition RANK Kimono: A O bi : A. Kimono: Very Good condition. Important Notice. I'm sorry, we can not accept, Asia, Romania,Bulgaria, Australia, Greenland, Denmark, Germany, Norway, Hungary, Finland and Poland in SAL. Sumptuous, vibrant colour on this kimono, the silk is super soft and luxurious. Sprays of flowers. Fully lined with super soft silk. Deliciously decadent to wear or stunning centerpiece in décor. It is made of Ostrich Leather and is lined in black satin. It has a double leather strap, an amber-like closure and two internal pockets. It is in excellent condition for its age and there is still a lovely lustre to the Ostrich leather and only minimal signs of wear at the corners. Japanese antique embroidered shawl made for the western market circa turn of the century. Has a rectangular shape with fringes at both ends. It is executed with padded stitch in a stunning palette of delicate colors of pink, cream, beige, sienna and tiny blue accents. This is normally considered to be for a chain of 7 years old and is worn for “Shichigosan” and other occasions. This set is ’used’ and is in excellent condition except for the bottom of the soles of the zori wich are soiled and the (see photo). Fukuro Obi:Good condition.A few stains. 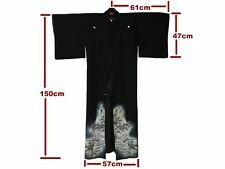 Material Kimono:Silky polyester Obi :Silk. Condition RANK Kimono: B O bi : A. Kimono: Good condition.Many stains and fading on inside cloth. Material Kimono:Silk. Condition RANK Kimono: A. Kimono: Very Good condition. C: Wearable. I'm sorry, we can not accept, Asia, Romania,Bulgaria, Australia, Greenland, Denmark, Germany, Norway, Hungary, Finland and Poland in SAL. 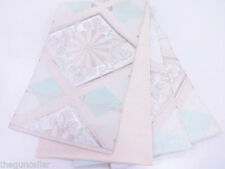 This lovely item is made of fine white silk with a subtle bluish gradation and is hand beaded. It has probably never been used and is in excellent condition with no stains or other defects. Note that the tiny pinholes along the edge are from stretching the fabric in the embroidery/beading process and are not defects. 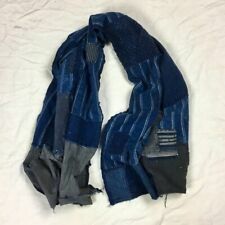 1800s Japanese Scarf Shashiko Boro Patched Patchwork Cotton Indigo Antique Old. Shipped with USPS Priority Mail. Wide store shawl scarf, with amazing workmanship. Just ask me and I will include a few antique Japanese kimono indigo fabric scraps for you to make any repairs you may want to, on this. The brocade is continuous on the front and back. (SKU# NH22019). Early 20th century. Material Kimono:Silky plyester Obi: silk. Condition RANK Kimono: A Obi: A. Kimono:Very good condition. B: Good condition. C: Wearable. Important Notice. 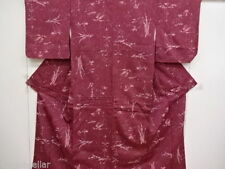 Komon 小紋　is a kimono with repeating patterns all over the fabric.Komon kimonos are the most casual kimono. Condition RANK Kimono: A Obi: A. Material Kimono: Silky polyesterObi: Silk. Kimono:Very Good condition. Title Kamakura Yoshitaro Collective Works. Kamakura Yoshitaro was a 20th century traditional textile artist,designated a Living National Treasure. known as a living national treasure. Japanese antique armor chest parts of Jinbaori for a yoroi. Muneate / breastplate(chest protector). Reference / Busho who was used this crest：Takenaka hanbe, Saito clan, Ushikubo clan, Yashiro clan, etc. Good Condition ~ Wear on corners, light discoloration on back silk. As pictured as is. The flowers embroidered in bright multi- colored silk threads using fine satin stitches. Japanese antique embroidered shawl made for the western market circa turn of the century. Has a rectangular shape with fringes at both ends. This shawl is an absolute work of art and its beauty is beyond words. It is made of shiny blue silk with embroidered cherry blossoms. Heavy gold, red, and green cords make up the wispy strings attached to the basket. The inside lining is a vibrant red. It would be a perfect art display if hung on a wall or a stand. Antique 194 0'ssilk kimono wrapper with lovely tropical leaf print. length: 54". fits like: free size. Our goal is to send zero waste to landfills, of the thousands of textiles & goods that people throw away every year, as much. as 95% could be re-worn or recycled or re-used. Material Kimono:Kasuri Silk Nagoya Obi:SILK Jyuban:Acetate. Kasuri (絣) is a Japanese word for fabric that has been woven with fibers dyed specifically to create patterns and images in the fabric. A beautiful embroidery of butterflies. Backed with a lighter silk in a slightly darker cream. There are many non-traditional ways for Westerners to wear kimono. They can be bloused and worn with a chain belt or sash. They can be worn open, as dusters or luxurious evening coats. Tan and white silk lining. Draped open sleeves. Black cotton blendminimal white flower floral motif. Size: One size fits most XS/S/M/L/XL depending on desired fit. Does have small hole on back flower overall great condition for age. This elegant furoshiki is of superior quality and was probably made in the 1960’s - 70’s. 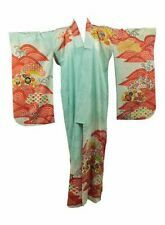 It is made of 100% silk shantung with a dramatic Kotobuki character in one corner. DESIGN: Kotobuki. MATERIAL: 100% Silk Shantung. Indigo dyed "Hanten (-Jacket)" from about 100 years ago in Japan. The design is so stylish and fine that it is not only great for antiques but also could be your unique daily-wear! Age: about 100 years. 2004 (out of print) Bilingual Maiko BOOK & DVD COMBO by Tetsuo Ishihara: Nihongami No Sekai - The Secret World Of Traditional Japanese Hairstyles - Perfect new condition. This amazing bilingual (Japanese/English) book by the renown Gion Hairstylist Tetsuo Ishihara unlocks all the secrets of the world of Kyoto's famous Maiko. Black silk brocade background with elaborate and intricate embroidery in color and gold threads that depict auspicious symbols such as the pines trees, white cranes in flights, peonies, cherry blossom and chrysanthemum flowers with a background of mountainous landscape. Modern Magnesium Composite Resin statue - "Resting Buddha". This is a modern replica in a sturdy mixed material with a gold finish. Board of Directors of the National Cherry Blossom Festival Committee.